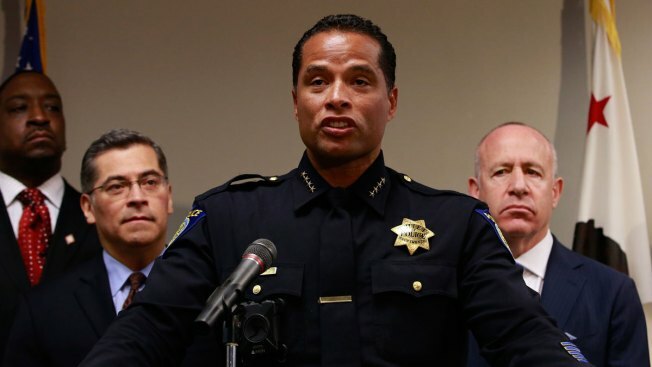 In this March 27, 2018, file photo, Sacramento Police Chief Daniel Hahn, center, flanked by California Attorney General Xavier Becerra, second from left, and Sacramento Mayor Darrell Steinberg, right, announces that he has asked Becerra's office to be part of an independent investigation of the shooting death of Stephon Clark by two Sacramento Police officers, in Sacramento, Calif. Hahn, Sacramento's first black police chief, is an unlikely officer, growing up in a tough neighborhood of California's capital city and having his own early run-ins with police. He is struggling to find the right balance of reforms after the fatal shooting of Clark by his officers. Sacramento Police Chief Daniel Hahn had his first major encounter with officers as a kid who witnessed a murder in a tough part of California's capital city. His second: as a teenager busted on allegations of assaulting an officer. "Nobody in my neighborhood thought about being a police officer," Hahn said in an interview last week with The Associated Press. The unlikely officer is now Sacramento's first African-American police chief, on the job less than a year and at the center of the nation's latest upheaval over the fatal police shooting of an unarmed black man. Hahn has received both support and criticism from some community members and black leaders, forcing him walk the line between protecting officers and supporting protesters as he contemplates changes to his department. 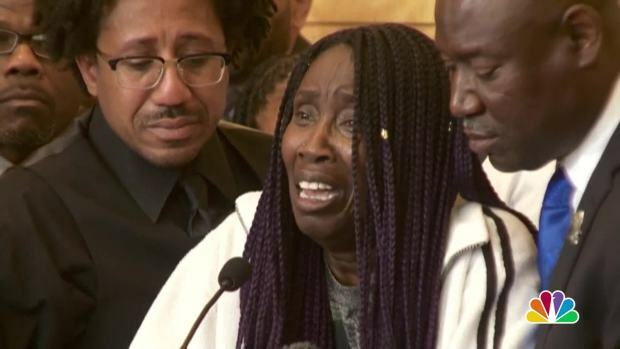 Demonstrators angry over the March 18 death of 22-year-old Stephon Clark have interrupted City Council meetings, snarled traffic and delayed thousands of fans heading to NBA games. Two officers responding to reports of a man breaking windows shot Clark in his grandparents' backyard because they thought he was moving toward them with a gun, police say. They found only a cellphone. A prominent pathologist hired by Clark's family says the autopsy shows the officers shot Clark from behind. Hahn, who became chief following other contentious police shootings, said the department is re-examining a generations-old practice of pursuing suspects into dangerous areas when other tactics might be safer. But he warned that every change brings consequences. "And so we have to make sure that we look at it holistically and determine, 'Are we OK with those additional or different consequences?' And if we are, maybe we do make fundamental changes such as that," Hahn said. He's also questioning a policy that allowed officers to turn off the audio on their new body-worn cameras, which he said "bred more mistrust." Officers are supposed to mute their microphones only for personal conversations or confidential communications such as talks with informants, Hahn said. It's unclear why they did so after shooting Clark and finding he was unarmed. The police chief's decision to release audio and video of the shooting just three days later earned him praise from black leaders. Hahn said it likely fueled protesters' anger but was worth it because it showed the city had "nothing to hide." He also called Clark's family in the days after his shooting to offer condolences. Some black leaders are praising his leadership since he became chief of the racially diverse city, even as they demand criminal charges against his officers. Hahn, 49, took over following police shootings that included the 2016 death of Joseph Mann, a mentally ill black man whose case led to increased training for officers on how to deal with individuals with mental illness, updated firearms policies and additional options for using less-lethal force. Betty Williams, president of the NAACP's Sacramento branch, called the latest shooting "a great test" for Hahn. 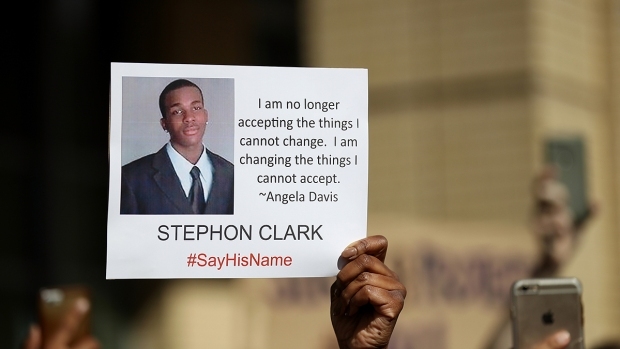 Around 500 people attended the funeral for Stephon Clark Thursday, where Rev. Al Sharpton gave a eulogy and friends and family shared memories of the 22-year-old father of two. Emotions have flared and protesters have filled the streets since Clark's fatal shooting by police this month. NBC Bay Area's Sam Brock reports. "He is a young African-American chief of police that's been in office for seven months. You've got an opportunity to be the model, to actually change the way they do things around the country — take it," Williams said. California NAACP President Alice Huffman praised Hahn's officers for showing restraint as some protesters tried to incite police into overreacting after Clark's death. "That had to be an order from the top to stay cool," she said. But Curtis Gordon, Clark's uncle and a spokesman for the family, is skeptical. "I thank him for the condolences, but Stephon's still not here. He won't be back," Gordon said. And Tanya Faison of Sacramento's Black Lives Matter chapter has criticized Hahn for urging protesters to remain peaceful. "I was really offended by that because we shouldn't be telling people how to mourn and how to be traumatized," she said at a City Council meeting. "We should be providing help for people." Eugene O'Donnell, a professor of police studies at John Jay College of Criminal Justice, said Hahn must balance changes to the department with the possibility of losing his officers' trust and morale by making them skittish or ineffective against crime. "We've got to stop police wrongdoing but we've got to make sure we don't stop police right-doing. That's a major conversation we're having in this country," O'Donnell said. As for Hahn, "Will he stand up in the gale force that he's in the midst of? It's an unenviable place for him to be." It's one Hahn didn't always expect to find himself in. His run-in with police at age 16 came after an argument with his mother, who called authorities. He was held on suspicion of assault on an officer and resisting arrest, though Hahn said he didn't assault the officer and wound up spending just four hours in juvenile hall. He later signed up for a junior college criminal justice class because a friend told him it was easy. Then he took the police entry exam because the test site was near his house and the pay of $8.14 an hour was more than he made at a local shopping mall. 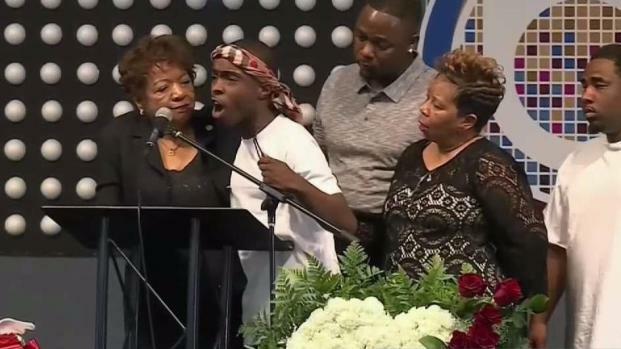 A special Sacramento City Council meeting held to promote community dialogue in the aftermath of the fatal police shooting of Stephon Clark was disrupted when his brother Stevante Clark marched down the aisle to confront the mayor, Darrell Steinberg. Hahn's roughest day on the force may have been when his younger brother, who was involved with drugs, was killed in 1992. He identified his brother's body. Hahn, whose mother died days before Clark's shooting, said he knows what it's like to grieve. He also knows his department must build better relationships with the residents it serves. "We can't just be there when we're arresting people," he said.